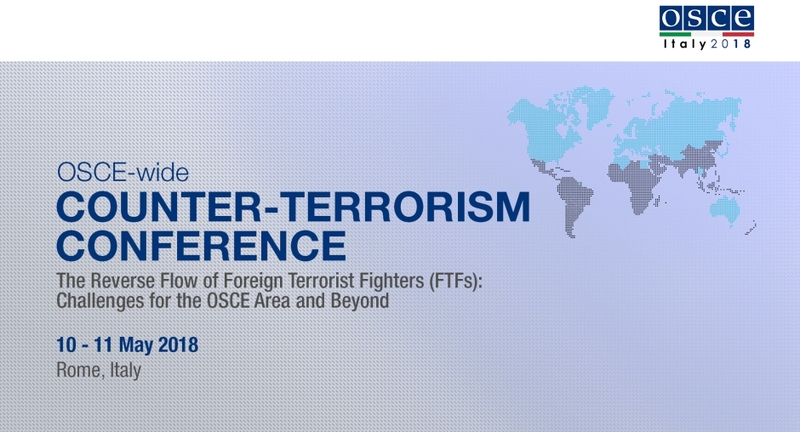 The annual OSCE Counter-Terrorism Conference was held in Rome, Italy on May 10-11. It was organised by the Italian Chairmanship-in-Office with the support of the OSCE Transnational Threats Department of the Secretariat. The main topic was the return home of foreign terrorist fighters (FTFs) from the Middle East and related challenges for the OSCE area. FTF departures to conflict zones peaked in 2015 and have decreased ever since. After the fall of the self-styled caliphate in Syria and Iraq, many foreign recruits to the Islamic State are trying to go back to their home countries. Some are relocating to other conflict zones Most of Europe and Asia is affected by this important issue. Governments are concerned that some of the FTFs may engage in violent acts at home, incite others to terrorist acts, take part in terrorist recruitment efforts and fundraise for terrorist organizations. The OSCE Participating States and their delegates were particularly interested in sharing experiences and solutions to equip law enforcement institutions to respond to terrorist crimes, working both effectively and in compliance with human rights and the rule of law. Strategies to disengage returning FTFs and their families from radical ideology were also discussed and generally found to be complicated. In addition, the conference stressed the need for further efforts in dealing with radicalization risks in prisons and post-prison environments. The role of internet usage for terrorist purposes was another key topic. The first session covered trends and dynamics of returning or relocating FTFs. It offered an opportunity to outline relevant policy and political commitments and explore ways to strengthen international and regional cooperation. Mr Laurence Underhill, a lead Daesh analyst from the UK Foreign Office, presented some key findings on the dispersal of the FTFs after the terror group’s loss of almost all territory in Syria and Iraq. According to him, the remaining Isis cells are in a transition back to covert terror operations, in the style of al-Zarqawi’s networks in Iraq. That said, after the experience of the Islamic State, the idea of a caliphate has become mainstream in global jihadism. Ms Claudie Baudino, Programme Manager at the French General Secretariat of the Inter-Ministerial Committee on the Prevention of Criminality and Radicalisation, presented the new national prevention plan, launched by the French Prime Minister earlier this year. This is the first plan entirely dedicated to prevention. Called “Prevent to Protect”, it involves 20 government departments and draws on feedback from first-hand experiences at the local level. It consists of five broad pillars and 60 measures. Ms Baudino also mentioned that France has the highest number of child returnees in Europe: 77 children out of 330 returnees, most of them under 10. The situation in prisons must be monitored as well: there are around one thousand radicalized inmates among detained common criminals and around 600 inmates charged with or convicted of terrorist offenses. Ms Julide Kayihan, deputy director general of the security and intelligence department at the Foreign Ministry of Turkey, spoke from a different point of view. According to her, the main threat is the PKK and the foreign fighters joining the YPG in Syria. She presented Euphrates Shield and Olive Branch as “counter-terrorism operations”, while many international observers know that the Turkish regime used extremist groups from the Syrian opposition as proxy militias to invade the north of Syria and Afrin, committing abuses against Kurdish civilians. Ms Kayihan justified these operations with the need to secure national borders. The second session focused on managing the return and relocation of FTFs by strengthening border security and information sharing. Mr Karel Pelan, Assistant Director of the Terrorist Networks Sub-Directorate at Interpol, presented the main activities carried out by his institution in this regard. They included several regional training courses for law enforcement officials and analysis of regional trends based on operational reports. Cooperation between the military and law enforcement allowed the exchange of battlefield information via Interpol and the sharing of more than 43,000 profiles of FTFs in the database. Mr Pelan also introduced the “First” project, with field support operations to collect FTFs biometrics in prisons and at the borders. The third session discussed the rehabilitation and reintegration programs within and outside the criminal justice system. Ambassador Fredrika Ornbrant, coordinator of Counter Terrorism at the Swedish Foreign Ministry, explained that the Prison and Probation Service has an internal intelligence service to identify radicalised individuals, potential recruiters and those vulnerable. This unit collects, evaluates and analyses the information and in case of radicalisation they separate the inmates. The Prison and Probation Service also collaborates with civil society on rehabilitation programs. Fryshuset, a non-profit organization that promotes youth development, has exit programs for those who wish to leave nationalist or Nazi-oriented groups. For his part, Mr Daniel Köhler, a researcher from the Ministry of Interior of Baden-Württemberg, warned the participants about the importance of assuring structural quality in programs working on returnees. A lack of standards may lead to substantial risks and blowback, he noted. The title of the fourth session was “Accompanying Family Members of FTFs: Legal Gaps, Juvenile Justice, Engaging with the Civil Society”. Many speakers stressed that women and girls were often forced into exploitation as wives of FTFs and faced severe sexual and gender-based violence. At the same time, other women supported or participated in terrorist and recruitment acts themselves. Everyone agreed that children and young adults are particularly vulnerable in an extremist environment. This session explored ways to provide appropriate gender and age-sensitive assistance, prosecution, rehabilitation and reintegration, support and protection measures in compliance with domestic and international law. * Matteo Pugliese is an ISPI Associate Research Fellow for the Center on Radicalisation and International Terrorism. Since 2015, he has been working with the Organization for Security and Cooperation in Europe. In 2017, he was appointed Special Representative of the OSCE Chairperson-in-Office, Sebastian Kurz, on Youth & Security. In 2018, he was confirmed the same position by the Italian Chairmanship.